Even though the picture that will follow has me think I gained a pound or two and I’m not entirely sure how to feel on that, I figure why not put this up and help with anyone who might be looking for a very last minute/cheap costume. Most of it can come from what you already may have in your wardrobe, even. Depending on if you want to keep your skirt for later use, you can glue or sew the candy on there. Personally, I chose candy that was wrapped (Starbursts, Tootsie Rolls, DumDums) and just sew it on; that way I could use the skirt later and eat the candy, too. I don’t suggest trying to sew candy corn on like I did, unless you have a strong, thick needle. WARNING: If you use lollipops like DumDums, sew the wrapper part AND around the stick, else it’ll move all over and fall off the skirt when you’re walking. Seriously. Secure it. 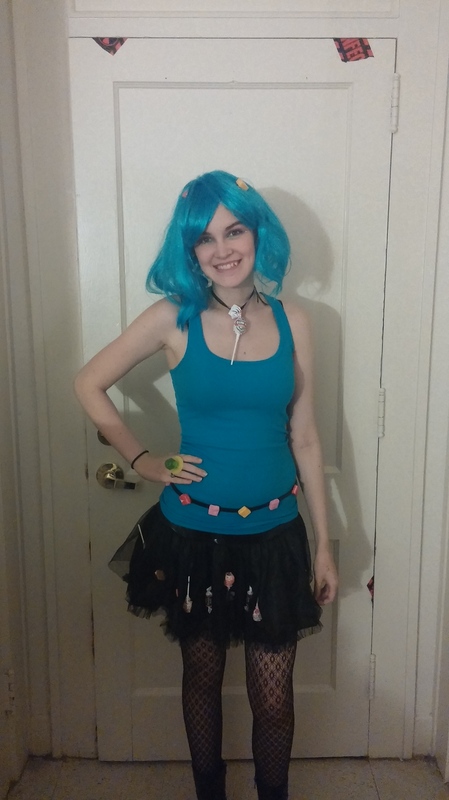 For the belt, you can really use any candy you want, I used Starbursts since they seemed the most likely to stay on and came in a variety of colors. Simply glue them on anywhere but the holes of the belt (preferably the back) then put it on and turn it so that the Starbursts face the front and the buckle faces the back. You can change it and make a candy belt buckle, too, if you want, this is just how I did it. The lollipop necklace is probably my favorite part. I used a Blow Pop since it was what I had and was bigger than DumDums, so it looked better. Simply sew the top part of the wrapper to a piece of ribbon, tie it onto your neck and wa-la! Candy necklace that looks at least a little bit more grown up. With the hair, after securing it all over with bobby pins, I had glued on Starbursts and Hershey Kisses to bobby pins, let them dry, then stuck them into the wig for little candy hair accessories. Now, on to the makeup. You can go and get a cheap 99 cent lipstick from somewhere, so long as it’s a bright color. I opted for pink since most of my outfit was blue already. It’s brighter in person than in a picture. When it comes to the eye shadow, I used blue on my lids, pink above that, and green in the inner and outer corners of my eyes, lining the bottom of my eye with it to connect the corners, too. You can do however you wish, just better go with the usual makeup rule; darker color on the lids, lighter color in the crease and above. The blush was just used more than one usually puts on to make my cheeks nice and pink. I also used little stick on gems (“diamonds”) on the outer corners of my eyes, and pink lashes since they came in a kit with my makeup. You don’t have to use those, but I think they are a nice add-on. You can also paint your nails for addition, too. I only didn’t because I forgot to. But there you go, a quick, possibly last minute Halloween costume. In theory, if you change the skirt to longer and get rid of the fishnets and make up, it could work nicely for a little girl, too. Though I can’t promise she won’t eat the candy while trick or treating.